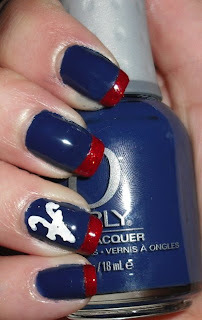 Imperfectly Painted: Baseball Mani for Father's Day!!! Hello there! I want to wish everyone's fathers/grandfathers/husbands with kids out there a Happy Father's Day! I'm pretty sure not many fathers or males for that fact read this blog, but I know my Dad does. 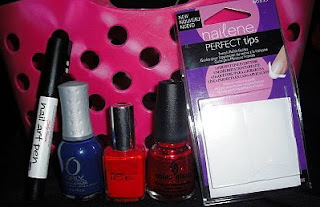 I've mentioned him a few times before, he has no interest in nail polish, but I know he reads my blog because he knows how important and special it is to me. I can't express enough the appreciation and admiration I have for my Dad. He has supported me in all my successes, failures, and everything in between. I can always count on him to be my #1 fan and biggest support. I only wish we didn't live over 1000 miles apart, because I miss him so much! In honor of my Dad on Father's Day I did a special fun manicure for him. My Dad is a HUGE baseball fan. He loves the Atlanta Braves. They are his team since he was born and raised in Atlanta,GA. He loves the Braves I'd say more than I love nail polish and for WAY longer. I decided to do a little Atlanta Braves funky french manicure for him today. I'm not great with nail art, but I tried! I used dark blue, red, and white their team colors for the manicure. The "A" is a little wonky, but for the most part I like it. It's very team spirited! Those of you who are celebrating Father's Day dd you get anything special or are you doing anything special for your dad today? Iris- So far, I've gotten my Dad a card. I'm making him something homemade for next when it comes to visit. Dad-Thank you for visiting today! Lacquerware-Awww thanks for the sweet comment. I loved my other layout wit the flowers, but I think this looks more organized and clean.